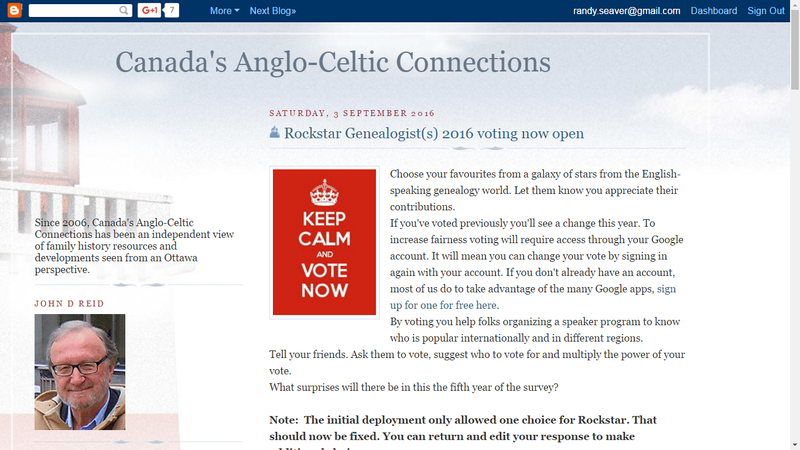 The nominations are in, and the voting for the 2016 Genealogy Rockstars has started on John D. Reid's Canada's Anglo-Celtic Connections blog -- see https://anglo-celtic-connections.blogspot.ca/2016/09/rockstar-genealogists-2016-voting-now.html. "To increase fairness voting will require access through your Google account. It will mean you can change your vote by signing in again with your account. If you don't already have an account, most of us do to take advantage of the many Google apps, sign up for one for free here." The link to Vote is on John's blog post. I have voted - have you? Oh, I am on the ballot - it's last-name alphabetical - in case you care.